With cricket fever gripping the nation this season, premium video-on-demand service Viu is back with its marquee cricket-gone-crazy property ‘What the Duck’. For the past 2 seasons, the property has received rave reviews and gained a large following amongst both men and women. Today the platform announces the launch of its hatrick season, promising to bring back the madness and fun for all cricket enthusiasts. 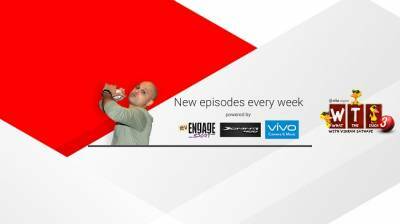 This third season will see Vikram Sathaye host 20 legendary cricketers on the show spanning 10 episodes. On each 15-minute episode, two cricketers will be seen together, engaging in a playful banter with Vikram Sathaye. The cricket duos on the show are Shikhar Dhawan & Bhuvneshwar Kumar, Michael Clarke & Brad Hogg, Mohammad Kaif & Harbhajan Singh, AB Devilliers & Jonty Rhodes, Ravichandran Ashwin & KL Rahul, Rohit Sharma & Ajinkya Rahane and many more, to share fun moments and interesting trivia on and off the field. Viu will also release unique short form comedy content on cricket titled ‘What The Duck Googlies’. The show will revolve around four popular stand-up comedians - Vikram Sathaye, Anirban Dasgupta, Saurav Mehta, and Sidharth Dudeja giving their comic spin on all the current and trending topics in cricket. The 35-episode show will be live on both Viu and YouTube starting May 2018.